This project log and choice of army represents a relatively substantial change from my normal endeavours, as I am typically painting Death Guard both pre- and post-Heresy in large quantities. To transition therefore to a loyalist force therefore represents a rather different challenge, driven in part of my love for Skitarii, but also for the potential gaming possibilities that I thought would be incredibly fun to explore. I had been made aware of the possibilities of allying with Flesh Tearers previously, and it was only recently I decided that it would be great fun to try this out, as it would be something incredibly different from my usual ‘slog-it-and-see’ Death Guard approach. 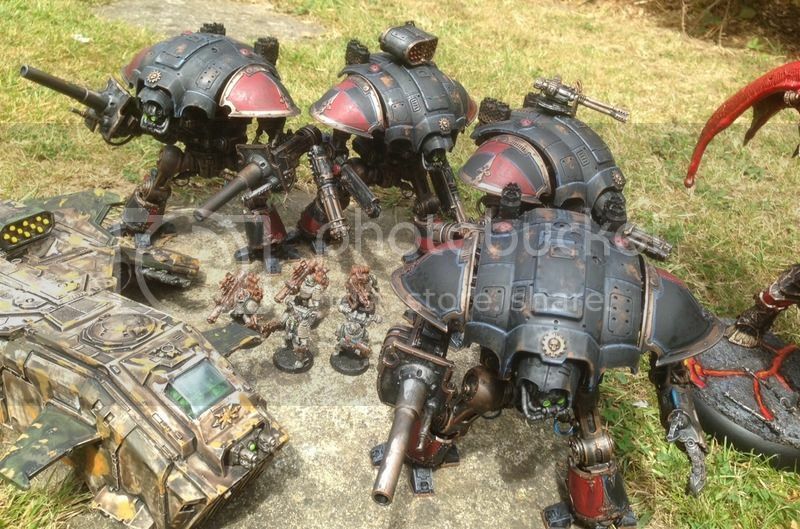 The opportunity to then expand a Skitarii army beyond that prospective list was assisted in part by the ‘Start Collecting’ boxes, and some opportune purchases of Kastelan Robots and Sicarans. 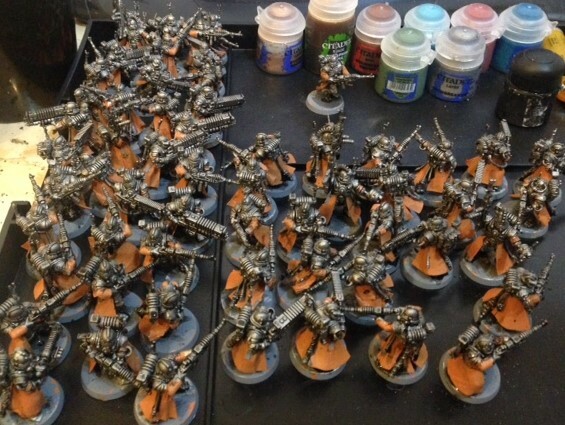 I was therefore set: I had a goal of a list that I wanted to play with and develop, a great opportunity to pick up the resources I needed, and the thought of having a rather different, visually striking army to boot. In order to get a correct number of Arc Rifles, I bought extra from the Kataphron sprue - and with a cut Radium Carbine, and a small piece of plasticard, we were in business! This log will continue to chronicle my progress with this army, and the list going forward! Edited by Chaeron, 16 October 2018 - 09:54 PM. Good idea with the kataphron Sprue arc rifles! Nice conversion! I hadn't considered doing that. Any idea what direction you're going to go with the color scheme yet? I will be waiting patiently for more! Edited by Beardbattered, 22 March 2016 - 05:45 PM. you are a lot more clever than I, but we had the same idea for the breacher arc rifles. 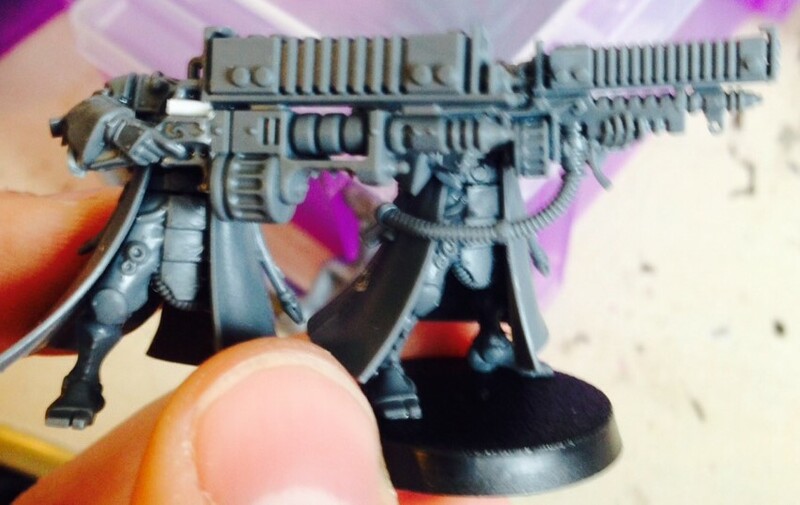 I Just glued the spare one I found to one of the shoulders of my vanguard and gave him a pointing hand, so he looks a bit more like he was completely connected to the machine. Will give you pics of it later! I did also consider that! But, I also wanted them to aesthetically all be similar too - hence my dilemma and hopefully what has come from that as a solution! Would like to see pics though! Edited by Chaeron, 02 April 2018 - 04:55 PM. For Ryza here's my recipe. "Eat a beaver you'll save a tree"
Nice idea with the Arc rifles! They could easily just pass for a different pattern. Im quite cheesed at the limited special weapons in the Vanguard/Rangers box. Edited by Master Avoghai, 29 March 2016 - 06:25 AM. Cheers, I'm just glad they weren't absolutely giant - otherwise I would've tried to have done them under-slung like Heavy Bolters... I figured at that size though, they were mechanised enough to carry. I did find it odd - but then, harking back to the old Tactical Squads where you had to buy the extra special/heavy weapons you wanted... I can see why. But by virtue of these weapons not being readily available elsewhere I had to get somewhat creative, as buying six squads is enough for anyone! Finally, have put a base layer of orange on all of the Skitarii Vanguard, the four Robots and Datasmiths, and my Tech-Priest Dominus. Quite a large batch, but it's good to get the main colours down first and blocked, before working in the detail. Next step will be to do all of the metals, before washing the cloaks and metal - and then I'll split off into poses and batch paint thereafter. Probably involves a final full batch paint of OSL weaponry, but that'll be fine! Edited by Chaeron, 02 April 2018 - 04:54 PM. Next steps will be detailing near the cloaks, before they are tidied and washed in turn. Getting there! Cheers WarriorFish! It's good to be able to do them in a batch, and is really helping to avoid missing details. I've got about 15 more models with trim on torsos and weapons left to do after a batch session last night. Then, I'll work through doing all the 'purity seals' and backpack lenses as a batch, and then hopefully move onto highlighting the weapons, tidying up the cloaks and weathering. All going smoothly though, and happy - these are a joy to paint! An Ironstrider I purchased arrived yesterday, so at least after I've got the majority of troops completed, I can diversify and go back to the Robots and that! So many dudes . . . awesome and ambitious project, though! I'm now simply waiting on things to dry! I've tidied the cloaks and washed them, I've highlighted the carbines, and picked out all the purity seals. The bases have been covered in Martian Iron Earth, and awaiting that drying - as well as the black rims. Few bits to tidy up there, which'll be done in the weathering stage. I feel some of the backpacks need a tiny bit of work, so I'll add stuff to that in due course. Looking lovely and cohesive though! Edited by Chaeron, 02 April 2018 - 04:56 PM. The skitarii are looking fantastic! A hair dryer does wonders to speed up the dry time on those bases I find. It's saved me a ton of time. The bases have cracked relatively nicely - I wasn't in a rush, but pretty happy. I'm thinking they will probably need a drybrush just for contrast, as it may just help to pick out some of the raised edges and crevices. On the whole though, I really can't complain! I'm thinking I may have to go down the hair dryer route for the bigger ones, such as with the Dunecrawlers and the Robots though! I wish I had that level of motivation . . . I'm proud of myself if I can just get a model or two assembled a day, let alone painting them. Crazy awesome to see this many done at once! Now I'll need to stalk your ETL vows to see what's coming up next . . . Cheers Vel'Cona - I've always enjoyed doing this, and it's really helpful to avoid missing things, and to make sure they all look uniform! If only I were pledged to the Ad Mech this year... alas...! Cheers HackedDuck - it's definitely worthwhile if you can not drop that standard. It's always my concern - and if it does come close, I do consciously stop myself. All now to do is to tidy up the few instances of basing that weren't perfect, and some lights on the back of the backpacks, and we're probably close to done! That's what I call a group painting ! Any close up to see the details of your minis? Looking good. I see I'm not the only one who does mass batch painting. Ryza looks pretty cool. I went with a classic Mars scheme but after looking through the painting guide I kind of wish I had gone Metallica. Apologies for not updating this in ages - with ETL coming along, I've been furiously painting for the Realm of Chaos! I did manage a lot of points, and have added a further four Renegade Knights to my Legio Mortis themed house-hold (so have a nice set of five, for future). Photo included in the spoiler below, just because it's also got a few Chaos-themed bits in! Aiming for a Legio Cybernetica list, hopefully themed towards the Dark Mechanicum if I can... All ties in nicely I hope! Will keep you updated on progress as we go. Edited by Chaeron, 02 April 2018 - 04:57 PM. Great to see this thread returning to operation!